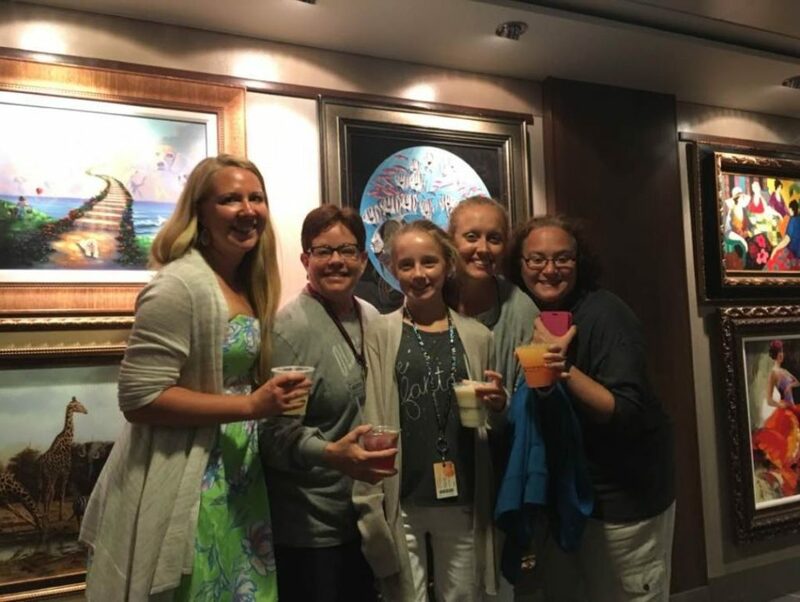 Last October I joined some of my family members for a 7-day, 10-person family and friends cruise! 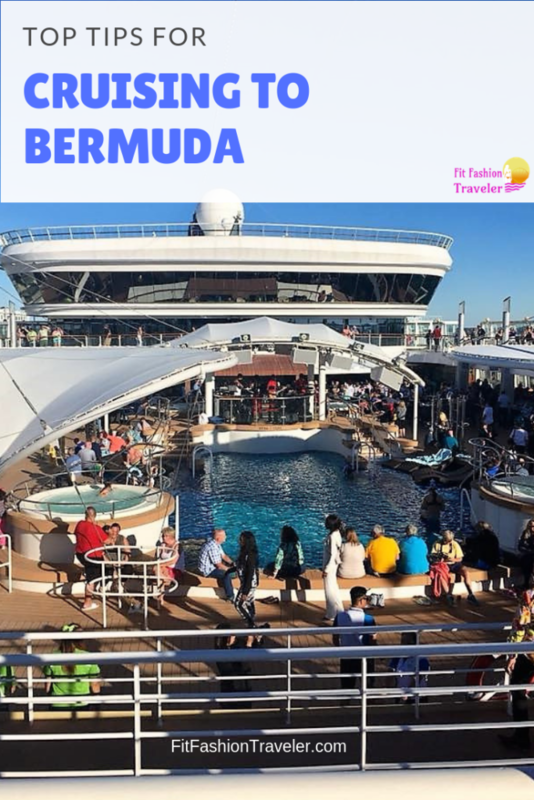 My aunt, uncle, cousin and her family, and three family friends flew out to Boston from Chicago to embark on the Norwegian Cruise Line ship the Norwegian Dawn with me on a cruise to Bermuda. Being an only child, most of my family vacations growing up consisted of traveling with just one or both of my parents, so having such a big group was a much different experience for me, and one that I certainly enjoyed! Leaving port, wearing our matching Bermuda shirts: key for locating each other on the first day! 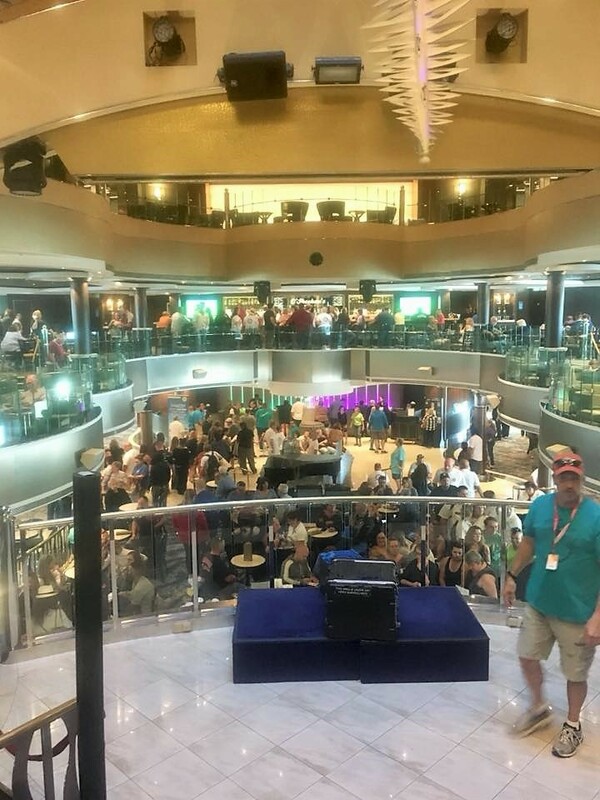 This post will focus on adventures and advice on board the ship that can transfer to almost any cruise, especially those on the Norwegian Dawn. In my next post I’ll provide a one-day itinerary of Bermuda and some tips and tricks for the island. Our cruise consisted of three full days at sea, one on the way to Bermuda and two on the way back. On the outbound trip the weather was warm and sunny so we were able to spend most of the day sitting by the pool and enjoying our unlimited drink packages, which are totally worth it! 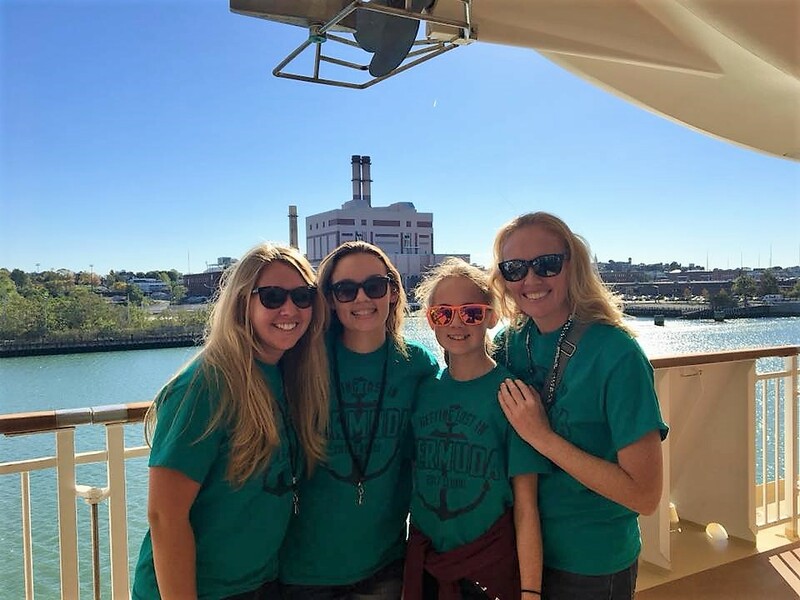 However, the return to Boston was marked by stormy skies and rough seas, thus requiring us to stay inside and partake in many of the on-board activities offered by the entertainment crew. We still made the most of it and had an awesome time on board. 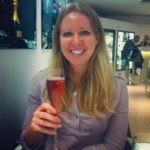 Here are some of my top recommendations for cruising on the Norwegian Dawn. If you have options for free packages with your cruise, the all-inclusive drinks and specialty dinners are absolutely worth it. The bar tenders will make any drink you want (don’t like the pre-made margarita mix? Ask for a cocktail made with just tequila, triple sec, lime juice, and simple syrup) and the food in the specialty restaurants is unique and delightful. The best part about the all-inclusive packages is that you can remove the stress of thinking about the prices of these things from your vacation! 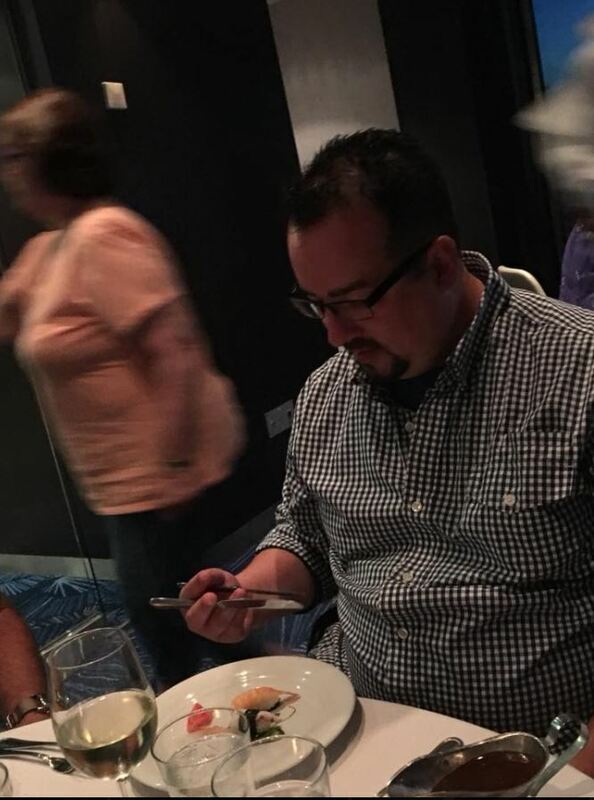 For those of you concerned about how to stay healthy with all-inclusive food and drinks, I’ll share a secret with you: one of the keys to eating in an all-inclusive environment is recognizing that it is not “all-you-can-eat” but instead a break from worrying about price. At an a la carte restaurant perhaps ordering two fried appetizers would be cheaper than the grilled salmon and your favorite vegetable, but in an all-inclusive situation you can go for the salmon with no worries. The same goes for the drinks: if you want to try the rum swizzle and then decide it’s not for you after two sips, you can ditch it without thinking about the $14 you may have just paid for it in order to spend your calories on something you will enjoy. 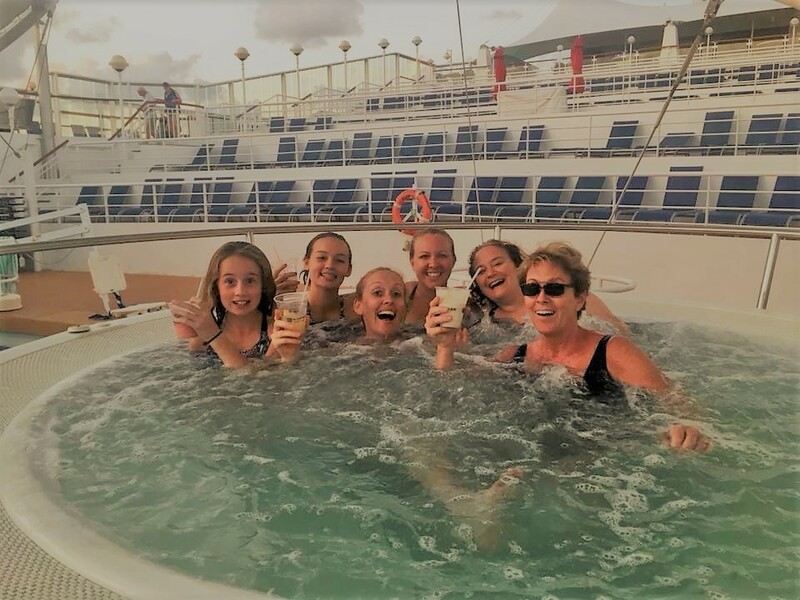 On the cruise, my travel companions and I appreciated having the all-inclusive option because it allowed us to enjoy a welcome cocktail when we first boarded, drink any wine we desired with dinner, and try a variety of mojitos from the mojito bar on the top deck. Keep in mind when ordering wine that the all-inclusive drink package will give you unlimited glasses, but you will be charged for a bottle! Instead of ordering a bottle of wine for dinner, we would each order a glass of the same kind of wine, and it was completely free. We also dined at two specialty restaurants, the Bamboo Asian Restaurant (which has free options) and Cagney’s Steakhouse, both of which I would highly recommend. Be warned that portion sizes in the dining rooms are smaller than on land: don’t make the mistake I did the first day at lunch thinking I could subsist on just a soup and appetizer salad! One of the first questions I always ask whenever I go anywhere is “what should I wear?” For the most part on the cruise, typical vacation or warm-weather attire will suit you well. If you plan to dress up, be sure that you wear shoes that can withstand walking on a rocking boat (aka no stilettos). There are no formal nights on Norwegian Cruise Lines, but you will not be out of place if you decide to throw on a cute dress or a collared shirt. In fact, in order to dine in the Venetian Dining Room at dinner time you must be wearing either pants or a dress/skirt: you will be turned away if you are wearing shorts, as our party learned the hard way. There are many other dining options so you will not be out of luck if all you have are shorts, but keep this in mind and pack at least one nice outfit if you want to keep your options open. The other special attire recommendation is to bring something white for the White Out party, hosted on the top deck the night you leave port. Usually the pool deck is relatively quiet at night, but for the White Out party the ship’s Cruise Director brings out live music and the dancing entertainment crew for a huge black light party! You can still participate if you are wearing colored-clothing, but most people will be wearing white, and it’s fun to get in on the festivities with them. 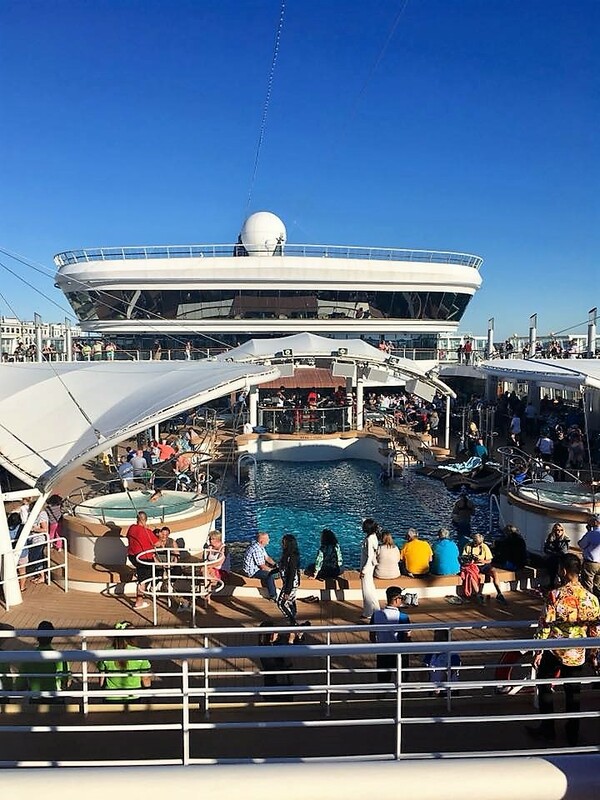 I’m sure thinking of cruise activities you immediately pictured yourself sitting by the pool all day while at sea, maybe reading a book, listening to music, and occasionally dipping into the water. Almost everyone else reading this also pictured the same thing, so you’ll either have to arrive poolside early to stake your territory or pick different activities to entertain yourself while at sea. 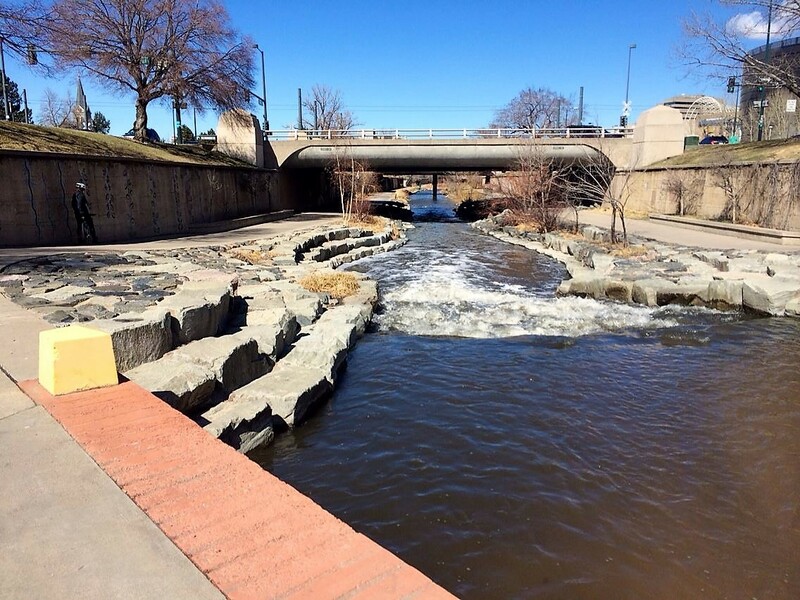 Even if you do claim a coveted poolside chair, your space in the water will be limited. One alternative is to spend some time in the gym or the spa. 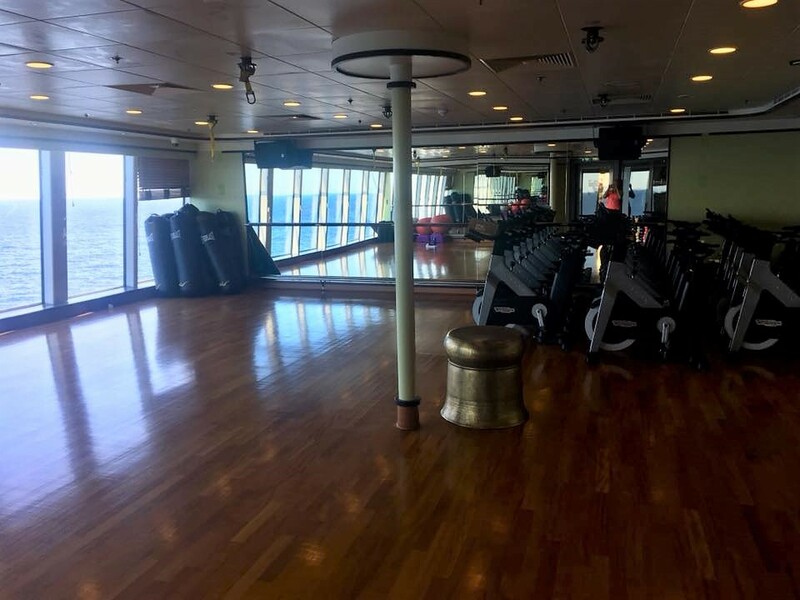 The gym on the Norwegian Dawn was incredible! They offered classes in their studios (some which cost money), and had a full set of cardio and strength machines as well as free weights. I made a commitment to go to the gym each day we were at sea and do either a HIIT, Cardio Dance, or Cardio Kickboxing workout. Two of the three days I used the studio because it was unoccupied and also had the most incredible views of the sea in its floor-to-ceiling, wall-to-wall windows. If you are able to make this type of commitment, as well as commit to taking the stairs instead of the elevator (saving time as well as calories) and practice the stress-free version of all-inclusive food and drink options, you could have an awesome vacation and come back a couple pounds lighter like I did! One thing to keep in mind if you do go to the gym is that the ship will be rocking, so this may not be the best time to practice your static squat. Another activity option is to check out the daily schedule of activities around the ship and pick a couple that appeal to you. 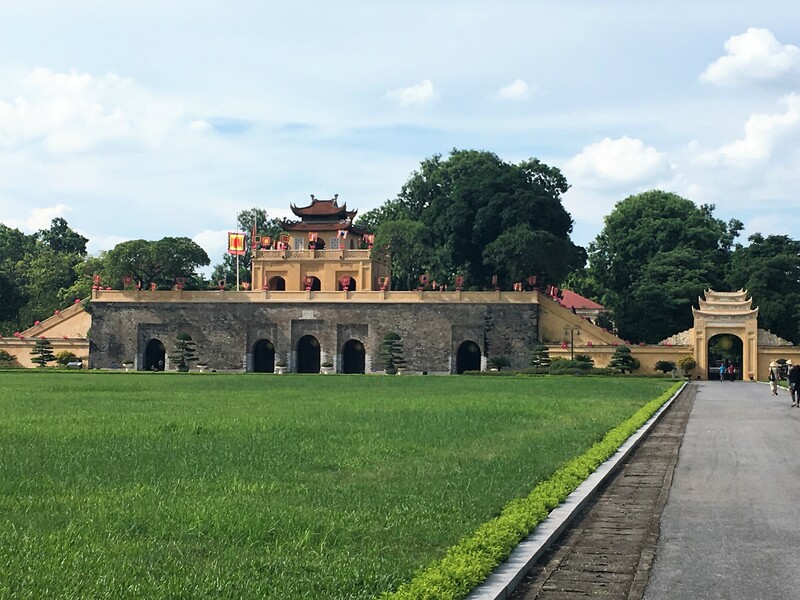 Because my travel group was so large, we were able to attend the activities we wanted, usually with two or three others from our group, and then reconvene for dinner in the evening. 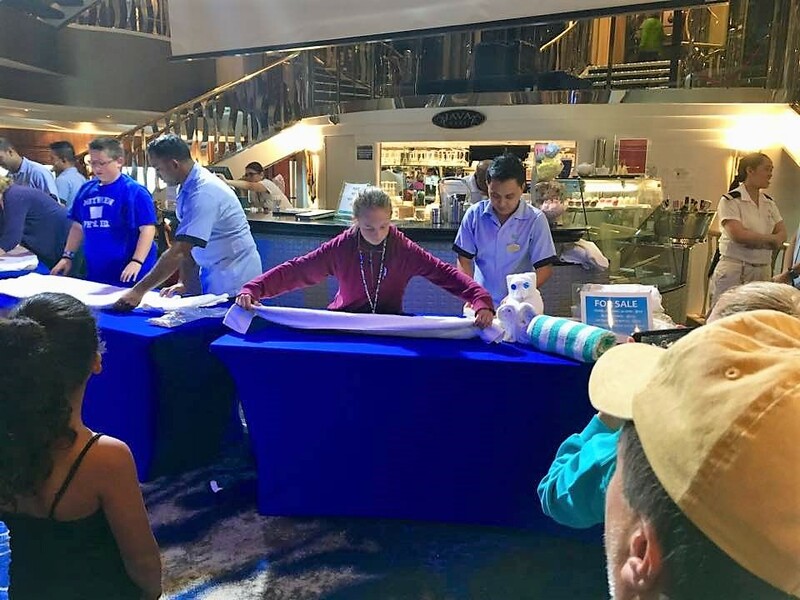 I was drawn to some of the travel trivia games, such as “Flags of the World” visual trivia, my aunt attended all of the arts and crafts options, and my niece was excited to help with the towel-folding demonstration. The evening entertainment is also plentiful, and you can’t go wrong with whatever you choose. We enjoyed the performances by the entertainment crew, comedy shows by Chicago’s Second City cast, and demonstrations by the resident illusionist. I was particularly excited for the Sunday night entertainment because the week I was on the cruise was the week the American football team the New England Patriots were playing a Super Bowl rematch against the Atlantic Falcons, and because the cruise left out of Boston, the game was being shown in the Atrium on a jumbo screen! 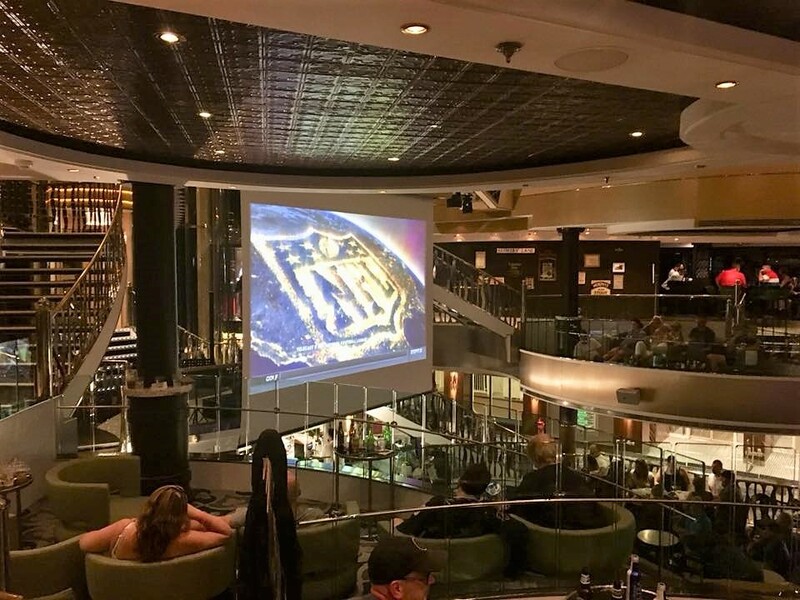 A few of the ship entertainers hosted a pre-game tailgate in the Atrium and the Irish pub overlooking the Atrium, then all the Patriots fans on board were able to watch the game and cheer together as we were once again victorious over Atlanta. I even made friends with other young adults from Boston once my Midwestern family became bored with the crushing blow the Patriots were serving the Falcons. My one regret from that night was not realizing that everyone else would be donning their Patriots apparel: I hadn’t even thought to bring it, as I hadn’t realized what a big deal the game would be while on vacation. My #1 recommendation is to download the NCL app to your smartphone before you even get to the ship. Once you’re on the ship, pay the $10 per person for the on-board communications in the app. It was so much easier communicating plans among the group using the app communications rather than our original plan of writing notes to slide under each others’ doors and hope the other people saw the note. The app will also give you the schedule of activities for each day of your trip, restaurant hours, and any other logistic information you need. If you decide to purchase WiFi, you will do this through the app as well. 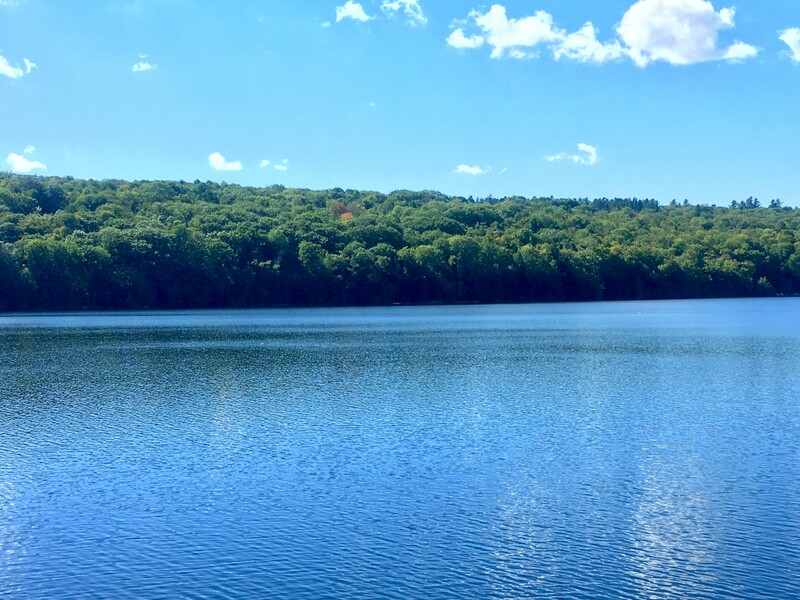 My second recommendation is to forego the WiFi and enjoy your disconnected vacation. If you need to purchase WiFi, purchase the cheapest plan, turn it on to quickly check your email, send a text, and post to Facebook, then go back to the website on which you turned it on and turn it off again. This will allow you to conserve your purchase and hopefully stick to the lowest paid plan, which was $25 when I went, for the entire trip. Another consideration is to try to select on-board activities that are not located in Gatsby’s Champagne Bar. I was disappointed with how the Champagne Bar was connected with the cigar lounge on board. Even though the smoking area was completely enclosed, the smell still eked out after a while. My 10-year-old niece and I enjoyed a few activities in Gatsby’s, like making flower crafts and learning Filipino phrases, but we couldn’t stick around too long because of how awful the smell became. Finally, my most fun advice: every day when you return from the island, put your bathing suits on, grab a drink, and head right for the hot tubs. There were almost no people there at this time because everyone else was getting ready for dinner, so we had the hot tubs to ourselves to relax and enjoy before beginning our evenings. It was the perfect end to each day, and something not to be missed. Cheers!